Good garlicky fast food is never easy to find. With blandness being the predominant flavor profile of most everything you can get out of a drive-through, getting something to eat with a bold garlic flavor is next to impossible. Garlic has been the territory of pizza chains for too long! Where is the affordable fast food that is bursting with garlicky flavor? 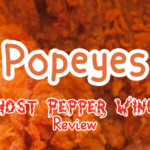 In June of 2015, Popeyes tries to rise up to the challenge with its Smoky Garlic Chile Chicken, chicken tenderloins marinated in a blend of smoked garlic and Morita chile peppers. 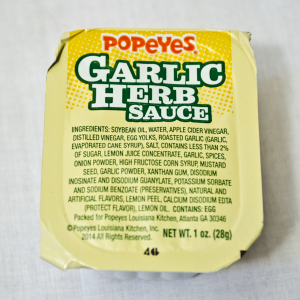 It’s accompanied by a new garlic themed sauce as well; Garlic Herb sauce. 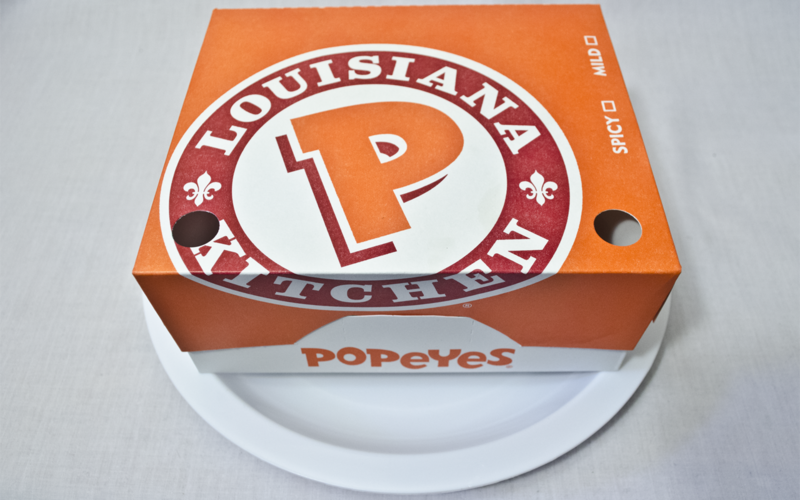 Popeyes is no stranger to bold flavor, so will this new item surpass flimsy expectations? After the jump is the answer, and the results are sure to be relevant to Sriracha fans. 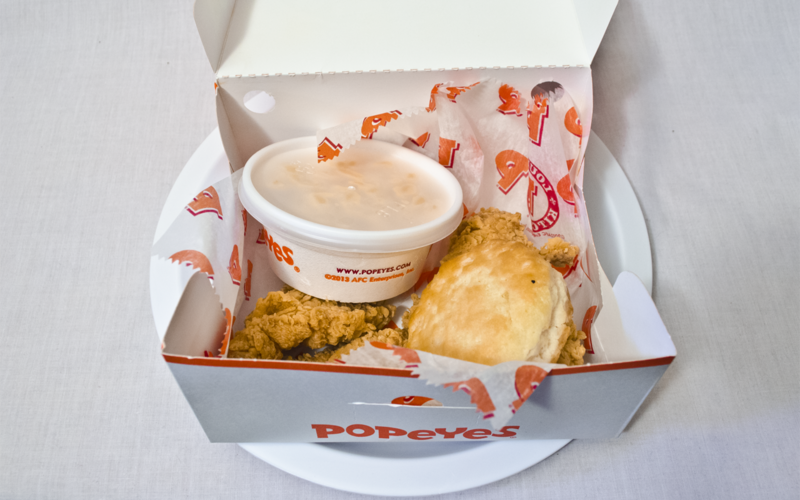 The combo comes with four chicken tenderloins, a single side dish, and a biscuit. 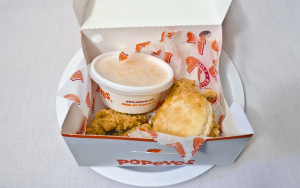 The chicken tenderloin is out of the norm for the standard Popeyes Limited Time Offer, which usually comes with chicken tenders made from shredded breast meat. That said, this wouldn’t be the first time they’ve offered it. 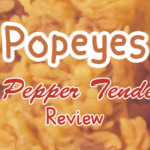 The Tear’n Tenderloin Chicken was Popeyes’ August 2014 offering, and it was more or less the same – four nuggety chunks of chicken, marinated in seasonings and served with a garlicky dipping sauce. The first thing we noticed is that the tenderloins were awfully small. Chicken tenderloin (the smaller muscle that makes up a chicken’s pectorals) isn’t very big in the first place, but these tenderloins were definitely from pretty tiny chickens. For a price of $4.99 without the drink, this was our first disappointment. Though tenderloin is a premium cut off of the bird, we had yet to determine if it was actually worth it. Our first bite was truly something great. Warm, smoky garlic flavor spread across our tounges and we immediately understood that this was the garlic bomb we had been hunting for. It was powerfully garlic, but not overwhelmingly so – tampered out with the fruity warmth of Morita pepper, it made for a well balanced but intense experience. The flavor, though as typically mild as fast food tends to be, even had a slight note of ‘fancy’, like a mediocre chicken parmesan. Sadly, the bliss is short lived. Four tiny tenderloins means four brief moments of garlicky heaven that left us craving more long after the final piece was gone. The meat of the tenderloin is soft, moist, and meaty, but not really that much different from their regular chicken breast offerings. This is a problem, because when you’re paying a buck extra for less food, you expect better quality. Even if the meat is the most tender part of the chicken, breading and frying it only serves to dry it out and make it stringy, just like all the other chicken they serve. It ultimately seems like a kind of pointless waste of meat, equivalent to using filet mignon in fajitas. 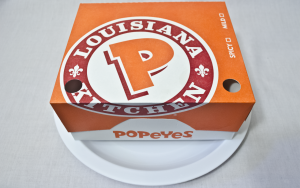 When we purchase the Limited Time Offers from Popeyes, we typically expect a big bargain – compared to the huge portion that last month’s Bonafide Big Box was, this is puny. What is a Morita chile anyway? The Morita chile peppers advertised sound pretty fancy, but a Morita chile is truthfully more or less identical to a chipotle (which in itself is a smoke-dried jalapeño). Depending on who you ask, it’s different by either being smaller or by being smoked for a shorter amount of time, but either way its only substantial difference is a fruitier note that doesn’t really survive being put through the fryer. It’s a bit strange why they chose this angle for their new product, rather than just making it with a chipotle seasoning and advertising it as such, but frankly the most mystifying part was that the spice mix tasted overwhelmingly like Sriracha – a flavor choice that would have made for a much better marketing ploy. Garlic plus chile is all it really takes to make something that passes for sriracha in the fast food world, and with something as respectably spicy as this, it seems to be underselling itself. The included Garlic Herb sauce is, upon first bite, strikingly similar to the Blackened Ranch, subbing out the smoky heat for more garlic. It’s a good pair for the spicy chicken, not making an active attempt to add any burn of its own and playing a key role in soothing the throat in between bites. Without it, the chicken seasoning quickly becomes overwhelming and mouth-coating. However, the actual level of garlic in this is pretty pitiful compared to how garlicky the chicken is. The herbs were the primary flavor booster for this sauce; it’s a good ranch sauce, but not an excellent garlic ranch sauce. Overall, was this the spicy, garlicky treat we were looking for? Signs point to yes, but the usage of flimsy tenderloins in lieu of more substantial chicken content was a real turnoff. 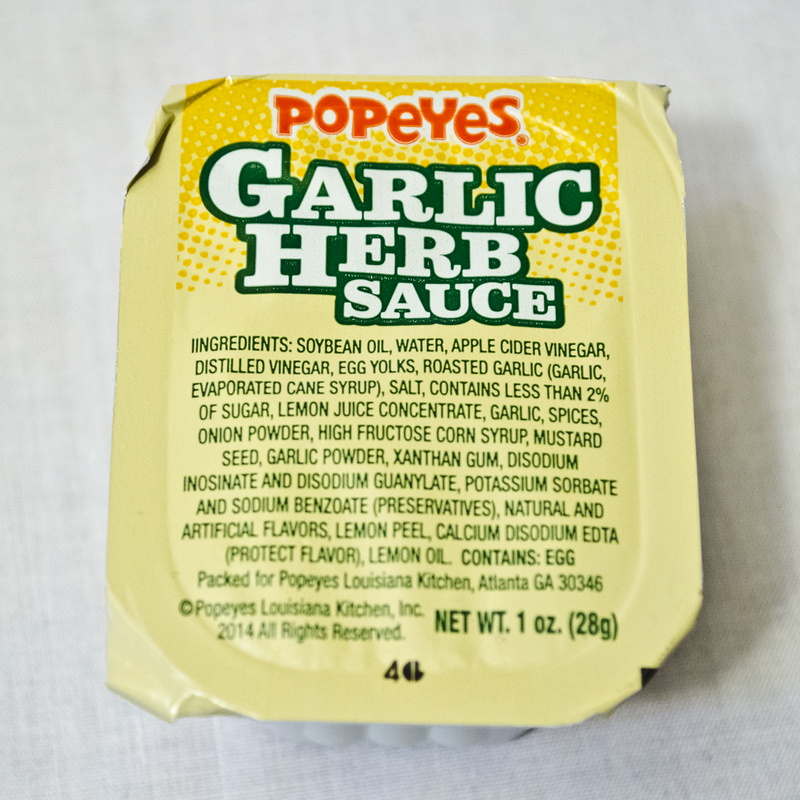 The Garlic Herb sauce not being as garlicky as we expected was also a bad sign, and in the end we have to admit this fell short of a must-buy. Sure, it’s extremely delicious… but the value is too poor for us to really recommend getting it again. 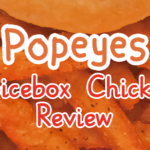 Sorry, Popeyes. I guess it’s back to garlic knots for us. I thought these were pretty good! The new Garlic Herb Dipping Sauce really made it for me. 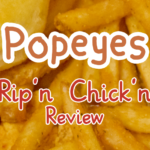 I just posted my review to my Youtube Channel, which you can find by searching “peep this out.” Love the pricepoint and the quantity that you get for the money.